orper mattis, pulvinar dapibus leo. A harmonious new range of e-liquids by Californian brand Liquid Sciences, Mello Buddha e-liquids are a truly one-of-a-kind collection: the flavours were developed with care all the way from their raw state to the finished product, in order to create the perfect blend, all without using heavy sweeteners. Most of the USA’s premium e-liquid makers are in one of two states – California or Florida. Naked Fish has a presence in them both. Planned and marketed from Boca Raton on the east coast, and mixed in Irvine on the west, these amazing dessert liquids have a real pedigree heritage. Discover Cheeky Monkey e-liquid, a saucy new range from TECC. These e-liquids are available in 0,3 and 6mg of nicotine and they come in a 75% high VG+ mix which makes these perfect for ‘Direct to Lung’ devices with a balance of delicious flavour and great cloud density. Cheeky Monkey e-liquids are manufactured in the UK and are available in 10ml bottles, boxed are is fully TPD compliant. Radical Vape brings you 5 delicious flavours of full spectrum CBD E-Liquid in two strengths, 300mg & 500mg. They come in a 10ml bottle, with a PG/VG ratio of 80pg/20vg for the best vaping experience, and come with a certified CBD concentration. CBD is a natural compound found and extracted from specific hemp strains. We use pure CBD crystals to produce 3 ranges of CBD vape E-liquids. Dr Salt e-liquids are a salt-base nicotine e-liquid (also known as Nic Salt) that captures the natural salts found in the tobacco leaf to deliver a really smoth vape with no harsh throat hit. This means the nicotine is absorbed into the the body more quickly, giving you a feeling much closer to smoking a regular cigarette. Dr. Salt e-liquids are produced in the UK, are fully TPD compliant and manufactured in an ISO 7 Class facility in Dorset. Shlurp is a range of premium mixed fruit and “Intergalactic Cola” flavour e-liquids featuring exotic cosmic ingredients such as… snoz berries, zang fruits and tingleberry nectar, and before anyone asks, we don’t know what they are either ? Shlurp e-liquids feature strikingly colourful branding and imagery, with their eJuice refills consisting of an 80% VG+ mix. Nicit UP is the Premium Nicotine Shot collection from Vampire Vape and is just perfect for adding to any shortfill ready e-liquids or DIY mixes ! Nic it up (nicotine shot) is a nicotine boost that allows any 0mg – 50ml nicotine free e-liquid to be converted into a nicotine-containing e-iquid with 50%VG+, 70%VG+ and 80%VG+. Top it up with Nicit UP… 10ml of the finest unflavoured e-liquid in.. It doesn’t matter if you are a complete beginner to the world of vaping or an old hand… Vape Monster’s mission is to provide customers with the best premium e-liquid money can buy. Vape Monster manufacturer their fully TPD registered e-liquid in Flint, Cheshire, in the UK to a 80% VG+ ratio to give the vaper a truly luxury vaping experience. Cloud Island is a UK based E-Liquid company producing a wide range of premium e-liquids. Cloud Island e-liquids all come as 50ml in a 60ml bottle, or what we call ‘shortfills’. Be it their fruit range, or their desert range Cloud Island e-liquids will leave your taste buds marooned. High 80% VG+ Premium E-liquids. Front Line e-liquids claim to produce the industries ultra premium ‘Max VG’ e-liquid for vaping devices. All we know is we can’t keep it on our shelves, so they could be telling the truth ? Made in UK to the very highest of standards in, research in the areas of, manufacturing, marketing, and branding Front Line e-liquids ensure us they will continue to deliver the ultimate vaping experience. Each 50ml shotfilled bottle comes in an eye catching metal tin with branded dog tags and cloth. LIK Juice e-liquids are made in the UK, they come as a 50ml shortfill in a 60ml bottle allowing you to add a nicotine shot if nicotine is needed ? Having decided to create a range of tasty and extremely palatable e-liquid refills, LIK Juice have just one final ambition with their e-juices, and that’s to make flavoursome juices that all vapers to enjoy. Pop Freak e-liquids are made here in the UK, and they come as a 100ml shortfill with 2 nicotine shots making the juice 3mg in strength if nicotine is needed ? Created for your taste-buds in four amazing flavours, you will not be disappointed with these straight from the pop fridge Flavours ! vapers to enjoy. Get Your favourite soda flavour today. Ladies and gentlemen, prepare yourselves for the ultimate vanilla custard concoction brought to your taste buds and by one and only Custard Company. Vanilla Custard e-liquid, the ‘BEST’ vanilla custard on planet earth, super smooth and with a sweet signature custard crating the distinct flavour of… well vanilla custard. 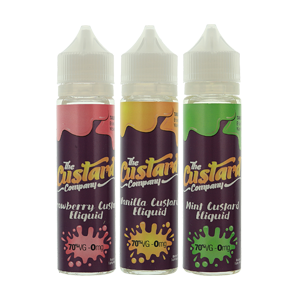 If your a custard, sweet or desert fan, you need this e-liquid! As the pre-eminent publication for vaping, insider knowledge of the business worldwide has put Vapouround at the forefront of what works well for vaping and have now applied that insight into making the best juices possible. Made in Canada by award-winning production heavyweights Premium Liquid Labs, Vapouround’s new flagship flavours have put a fun twist on two beloved tastes. Zom-B Cloud e-liquids feature strikingly colourful branding and imagery, with their e-Juice refills consisting of an 80/20 VG+ mix. They come in four fantastic flavour blends that feature an array of exotic ingredients, and are manufactured here in the UK.